When Rene Lalique designed the first bottle for Coty's perfume, he originated the concept of a specific bottle for a specific fragrance. This is the definitive book for admirers and collectors, complete with descriptions and color illustrations of all Lalique bottles. 160 pages, HC, 9" X 9-1/2". 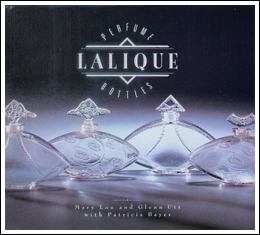 A special treat for Lalique fans is the companion facsimile folio showing all available bottle designs. 115 pages, TP, 13" X 9". We have the last remaining stock, as both books are now out of print.